Supers know that Halcyon City, the greatest city in the world, doesn’t just exist in this dimension. It’s a nexus of the multiverse, where an enterprising dimensional shifter could hop around to all manner of other words, with other problems, other powers—other versions of you. Four new playsets, including the alien-resistance story of Iron Red Soldiers; the gritty street-level crime drama of Spiderweb; the teen antics of Phoenix Academy; and the cosmic roadtrip adventure of Apocalypse Sonata. 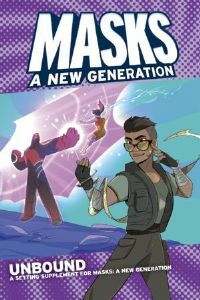 Three new limited edition playbooks to add to your game of Masks, along with advice for using them in your game. Does your team of heroes have what it takes to explore the infinite varieties of the multiverse? Time to find out.